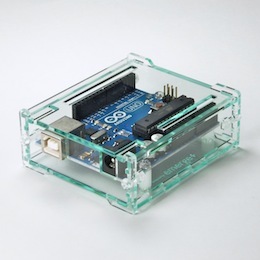 This is a very simple project box for Arduino boards designed by Emerge+*. The box comes with 6 acrylic boards, 4 screws and 4 nuts. This box can be used with any board that has the Arduino layout, the pre-R3 boards, the new R3 Uno, The Leonardo. You can put a mini breadboard on the top plate for easy and compact prototyping without a shield. By removing the top plate, you can mount regular shields, e.g., an Ethernat shield, and an XBee shield, for more involved projects. note: 8 screws and 4 spacers to hold an Arduino are included. note: This box is available in four different colors. Pink, Blue, and Smoke gray. *Emerge+ is a small company in Japan. It specializes in laser cutting.